What do magicians call that dealio, where you (and your audience) look at your right hand twirling a pencil, as your left hand palms a coin or something? 6-year-olds can do that. Also Jerry Dipoto can do that, as he just did at first base. Pay no attention to the names listed at RF or SP. Q. 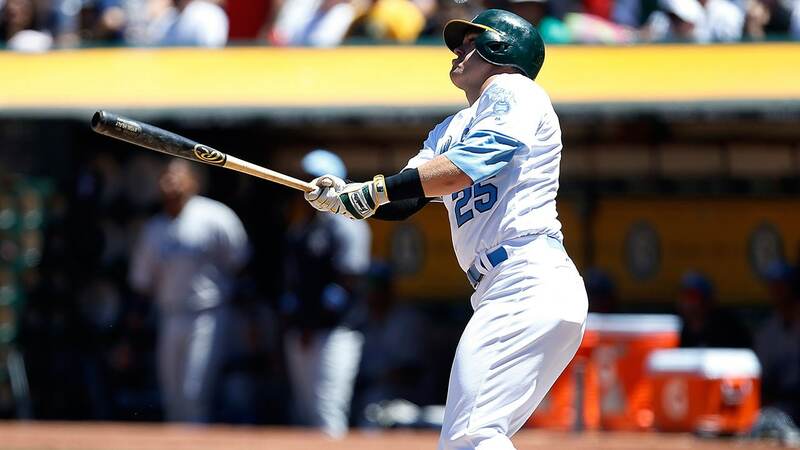 Does the Mainframe see a 10% possibility of Ryon Healy becoming a big star? A. The Mainframe notes that Billy Beane much preferred Matt Chapman at 3B and Matt Olsen at 1B, shedding Healy to make room for them. Weird thing to do if you think you're looking at 40 club-controlled homers. Q. Does the Mainframe see a trend of Jerry Dipoto going for 25-year-old "rookies" who change the scoreboard for free? A. What'd he call it, "balancing the payroll." Chuckster used to call it "keeping the powder dry," although the Armstrong powder stayed in a barrel between about 1986 and 2014. Dipoto's powder could blow at any moment. Nice to see the M's "canceling the fractions" at 1B while they train their snake eyes at RF at SP2. With every passing day, Dr. D grows ever-more unbalanced about the chances of a big add on the rotation front. Q. How much difference between Healy and the other 1B's we'd got from Oakland? A. Between Healy and Valencia, prob'ly none. Between Healy and Alonso, probably a very discernible OBP difference, but perhaps not $10M worth. We remember the days, circa 2005, when at USSM this was the Holy Grail and then some. To get moderately-inferior performance for 5-10% of the salary cost. So if you're in a time-warp mood, break into your 2005 happy dance. Q. Maybe a platoon with him and Vogelbach, depending on how things shake out? A. Until proven otherwise, Dr. D is assuming that Vogelbach said something he really, REALLY shouldn't have. Also, Dipoto made it a point on Wednesday that Healy can hit RHP and is the everyday 1B. Sorry, Keith, we did give away Mike Montgomery as an act of sheer altruism. Q. What is a "Scrub" in your "Stars & Scrubs" paradigm? A "scrub" is NOT a bad player. A "scrub" is a CHEAP player who OVERPERFORMS HIS CONTRACT. A Civic is a vet who will absolutely play to his contract, exactly. A Star is why you find scrubs - so you got money left to pay them. The Stars give you a shade the more, a shade the less, you don't care. You pay him $27M and he gives you $22M worth of bases, that is peachy keen. You just don't want them hurt. You want them to play, is all. Get it? "Got it." Good! Stars & Scrubs teams all have Civics. Stars... Civics ... Scrubs. I'm not sure what you call James Paxton. The reason to follow sports, I guess. Q. Doesn't Billy Beane realize that you can manufacture middle relievers? A. Shows you what people think of Emilio Pagan. The insiders are way, WAY ahead of us on middle relievers, trust me on that one. Usually some guy is throwing the stuffing out of the ball in AA or AAA and they already Know. Q. What's SSI's position on this fad comparison between Ryon Healy and Mike Zunino? A. Nobody and nothing compares to Mike Zunino, and this includes the various iterations of Zunino himself. But Healy has shown some pretty long stretches of .500 SLG type power, real natural juice in his swing. An off-and-on ability to hit 13 homers in six weeks. We can see why the two would be connected in that way. We might also note that a 111 OPS+ is better than your average Mariner gets in his first 800 at bats. B-ref's comps for Healy include - wait for it - Jim Edmonds (cough), Jason Giambi, Ivan Calderon, Bobby Higginson, and my personal fave, Aubrey Huff. Why they compare a bunch of .375 OBP players to Ryon Healy and his 35:202 EYE, you'll have to figure out for yourself. You get back to asking whether Healy (with Edgar's help) can push his EYE up to .25, .28, something like that, in which case his natural power throws him into the Mark Trumbo, Adam Jones, Corey Dickerson range. Jerry Dipoto thinks he will, and that Healy will give us a 110, maybe 120 OPS+ at first base for several years - for peanuts. That's what Dipoto's advertising. :: shrug :: Healy pencils in as a Quality Scrub in terms of bases per dollar. Personally, I'm already thinking about RF ... or SP ... or whether Healy's moving on in a shock swoop for Giancarlo Stanton or something. RHP Thyago Vieira .. for $500K !! Another JeDi mind trick. “These are not the droids we’re looking for,” he said, when asked about 1B-men with terrible Eye. Yet, it turns out we sort of were. And, to tell you the truth, I sort of applaud. Healy is dirt cheap, hit.300+ just a year ago and hits the ball over fences at an appealing clip. vR, you ask? .853 in ‘16, .717 in ‘17. Of course, it does look a bit like the league’s RHP’s booked him last season: His vR OPS dropped while his vR Eye went from 10/48 to 16/112. LHP’s he rakes, .314-.353.-534 for his career. Here’s to hoping Edgar the “Zunino Whisperer” can return Healy to his ‘16 vR form. So now we go get Jackie Bradley Jr? Pagan was expendable. Healy frees up a ton of cash. The next move will be cool to see. "Dealio" -- Oh My Word! I love this crowd for many reasons, but one of them is occasionally being hit with an obscure blast from the past. I haven't heard the (slang) word "dealio" since late Jr. High or early High School. Like you used it here, it was used as the equivalent of "thing" and usually referred to some quirky gadget or activity. Cool! Thanks, Doc! He went from hitting 10 homers in a full AA season at 23 to hitting 25 in the bigs two years later. He doesn't walk but was quick to realize if he just swings hard with the way these baseballs are jumping he'll be fine. We liked him for his ability to actually put a bat on the round thing when he guesses right, and he guesses right enough for us to like him. If the baseballs go back to their 2014 springy-ness levels any time soon, he's complete toast. So take that FWIW. Apparently we were sad to get off of Trumbo, but wanted one with 20 more points of BA and extra club control. There are worse things to get for minimum salary; it'll be fun when he struggles against righties this season and we can't figure out whether to platoon two large humans at first base, though. They're all just holding the door for Evan White though, right? Give it a couple years, then spin Healy off like Kotchman - assuming those baseballs are still playing like superballs anyway. As you said, Doc, it would seem to indicate dollar resources going elsewhere, and that's really the key takeaway. Seattle having a sub-par first baseman? That's just business as usual this decade. Toss Healy on the pile and move on to other important business. "Here Otani! Come here Otani! Here boy!!" And that international cash gets us close to the top teams this year, I would suppose. I suggested we could send Vieira to Chicago, but thought Abreu might be part of the return. I was wrong. If the new MLB paradigm is cold decking power bullpen arms and throwing them out in succession from the 5th inning on, Pipoto just became a contrarian of sorts, at least when searching for bigger pieces. This is an important point. If Marc-O is going to go 4.2 IP, you just offloaded two potent weapons for the 6th and 7th. Pagan was good and could throw a lot of innings. Healy is a platoon 1b until shown otherwise. Don't like it, as I think its a high probable downgrade to the immediate roster and creates a potential hole at 1B if he doesn't pan out. Healy would have to break out for it to make sense. How much more you going to get for a 7th-inning rookie RP my man? Pagan was really good. And improved as the year went on. With 80+ innings between MLB & AAA, a lot for a reliever. A power reliever that can go 80+ innings is extremely valuable in today's game. With the shortening of the game you can't be rostering LOOGYS or ROOGYS anymore. I'm also not impressed by Healy so far. Looks like the weak side of platoon 1B. He pretty much needs to break out for this to make sense. I feel like you might be overselling Pagan. Yes, he was effective last year, his first year in the majors, the year most everyday releivers are the most effective they'll ever be in their MLB career. Yes, he was able to translate his strikeout stuff from the minors to the majors. Many pitchers can't and he did. He deserves note because of it. Still, he's a flyball pitcher and his effectiveness over his career will be decided by his HR/9, or, how many of his flyballs die on the track vs. hit the first row. Last year, his HR/9 was 1.25. His HR/FB was 9.5%. Is that sustainable? Maybe. It's a genuine possibility. Looks to me like Jerry's betting against this outcome and the A's are betting that their Coliseum will mitigate that risk. Both are reasonable positions to take. Let's not pretend that the downside risk isn't present. Pagan is valuable. So is a stoploss suture at a position that the M's have been hemorraging at since Richie Sexson was good. You do have a point there. I guess I don't trust Dipoto's judgement calls very much anymore. Mostly due to frustration over the Chris Taylor and Gohara judgement calls. I trusted him at the time of those deals, but reality has shown that his vision of those players didn't pan out. The most recent versions of Pagan and Healy, show Pagan as being more valuable. I put more emphasis on recent reality over Dipoto's vision of the future at this point. However, that doesn't necesarrilly mean Healy won't be more valuable than Pagan going forward, or even break out as a star player. Baseball is pretty unpredictable. I think it is entirely possible that Pagan is a more valuable ballplayer in the aggregate. HOWEVER...when you compare Pagan to other relievers, what is the difference between his value and theirs (accounting for $/WAR and such). Now...what's the difference between Healy's value in $/WAR and the other first basemen we could have gotten? It's possible that Dipoto may even believe that Pagan is better value than Healy in isolation, but that the Mariners need a cheap Healy more than they need a cheap Pagan. Ootani could save the Ms from their rebuild, but that is pretty much the only scenario in which I can envison that happening. A free superstar in the rotation young and cheap + a free young position player in one package, who will be loyal and easy to resign through his prime. Failing that the Ms need to rebuild, or eventually they will be forced into it in a position of weakness. The lack of self honestly is one of the main reasons for the mediocrity over the last decade and a half. The Helio: It 's another 2 or 3 step dance. Well, DePoet is playing the dominoes again. He just played one: trading Viera to the White Sox for International Money to add to their offer for Oh Oh Tani. Amount yet to be announced, but some speculation it will give them $5 mil in international pool money ... the most any team can offer to BabeRuth-san. So it costs you Viera for $3.5 mil in the reach to attain Oh, Oh, Otani ... and you gotta spread that over all 6 years which is what the contract will be if the Players association goes along with the train by this coming Monday ... so that comes down to about $520K per year for Viera. And signing Helio on the cheap gives them an SP, a RF, and a 1B ... and leaves room perhaps, for a Darvish. That is hitting the superfecta. If, as Gordo suggests, the ball goes dead (which is very doubtful after seeing the ratings for the past WS), then Helio gets gone as White emerges. Also, Helio suggests he likes Safeco, and should allow better numbers than in Oakland. So, what 's the next step after BabeRuth-san, if not Darvish? reporting on Manfred's statements at GM meeting yesterday. MLB and HamFighters have agreed to grandfather him under the old posting system. The Players Association will annouce their decision this coming Monday, but Manfred says problems in them agreeing are "minor". Total M's money in international pool should be around $2 mil (forget the figures I cited in earlier post about how much whitesox money was shifting to M's on Viera deal). Some confusion might still remain as one report last week suggested the new posting system would be pushed back a year ... but that could have been part of the Players Assn reluctance. What happened to the postponing the posting me don't know. Big news. Thanky kindly Zoom. That one is key, and seems the only possible explanation for a $500k Vieira. The player prefers the spelling: Ohtani. It's been bizarre reading articles from various newspapers in Japan and elsewhere dueling on this. Perhaps there are bigger issues which have yet to be resolved, however.